The soup! Finally the soup. 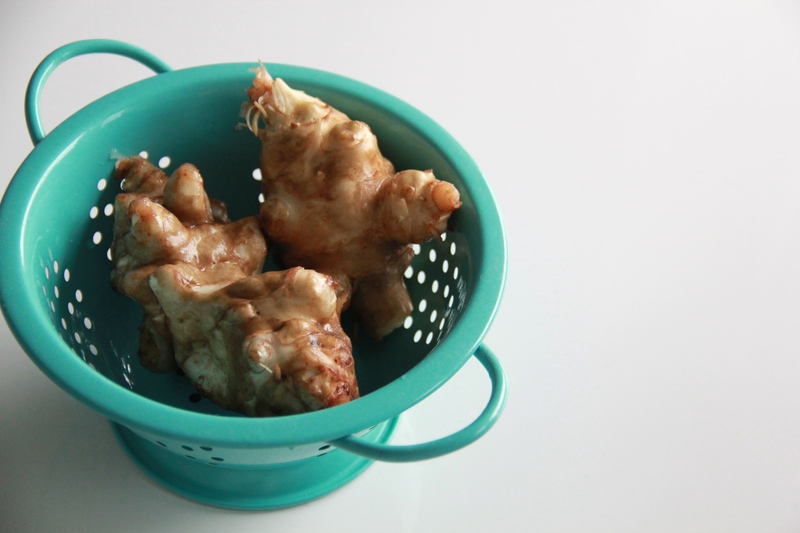 Have you ever eaten sunchokes before? They’re a root vegetable, also called Jerusalem artichokes (though they have nothing to do with either, apparently) or earth apples. Earth apples! Sounds like some kind of alien pet name. Let’s go with sunchokes. They’re weird little gremlins, all gnarled and lumpy, but oh — they’re delicious. Kind of sweet and earthy. 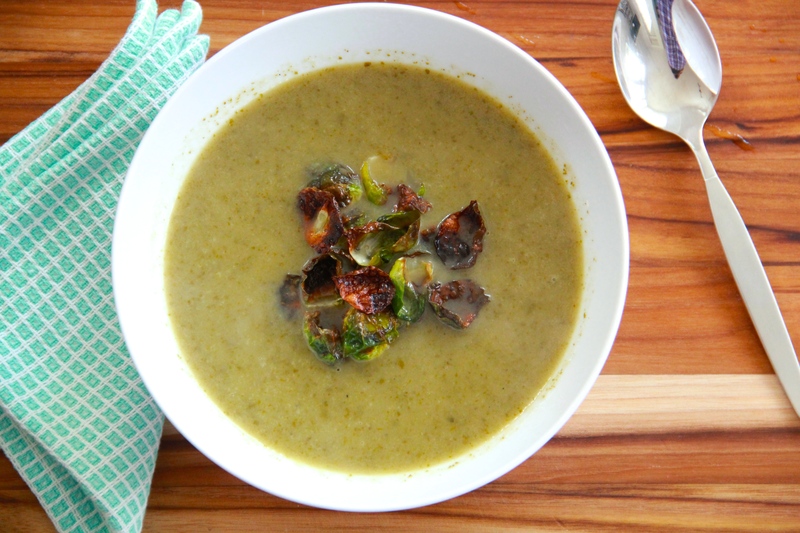 Paired with mild leeks and fresh garlic, they bring a real sense of depth, a rich kind of grounding, to this bright and verdant springtime soup. I ate this for a week straight, you know, the week just after the roasted rhubarb, and just before the diamond ring. It’s a happy sort of soup, I think. 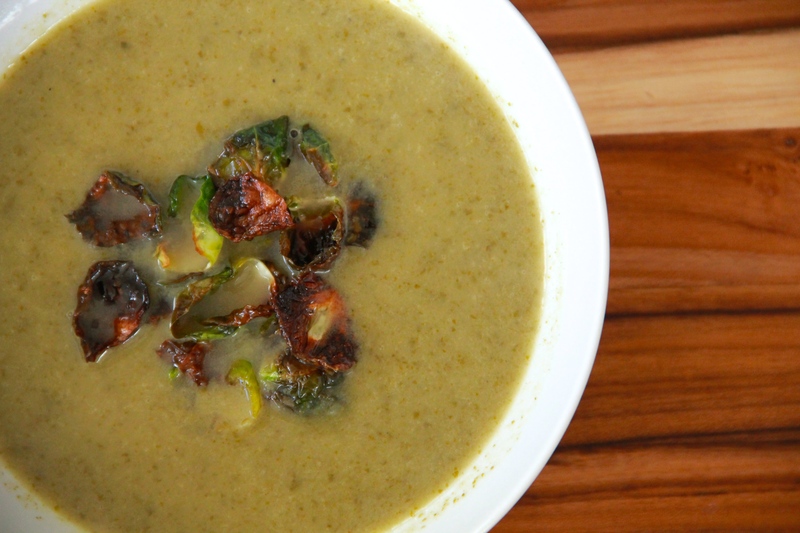 It’s a soup good with bread, or goat cheese toast, or topped with roasted Brussels sprouts chips (those are a thing, and they’re amazing – recipe coming soon) or just an extra dollop of crème fraîche. It’s a soup fit for spring — for rainy mornings and budding branches and cool, puff-cloud sunsets over Greenlake (and beyond). I found sunchokes at my local farmer’s market, but if you can’t get your hands on any, you can substitute turnips or parsnips instead. Also, if you’ve got a high-speed blender, use it to get the creamiest, dreamiest green soup — my regular Kitchen Aid number couldn’t really handle the job (hence my speckled-green soup, which I actually don’t much mind). Heat a large pot or Dutch oven over a medium flame. Melt the butter in the pot. Add the leek and onion and a big pinch of both salt and pepper. Sweat the onions until soft and translucent, about 10 minutes. Next add the garlic, and cook for a minute or two, until fragrant. Add the sunchokes and arugula and continue to cook, stirring to incorporate and tamp down the bunches of arugula. Once the vegetables are all soft, add the chicken broth, and bring the soup to a boil. Reduce the heat and simmer the soup until the stock is hot and the vegetables are quite tender. Puree the soup, either with an immersion blender or in batches in a regular blender, until smooth. Stir in the creme fraiche, and serve hot, with plenty of bread for dipping. Love this recipe. Now have to find these weird little chokes. I got all (sun)choked up reading the engagement post.